Anyone and everyone knows what figure skating is….but not everyone knows what synchronized skating is, so I’m going to try and explain it. In a way its similar to synchronized swimming….but on ice instead of in the water. Instead of skating by your self or with a partner, imagine skating with 12-16, or 20-24 girls or guys. And the system is similar to that of the singles/pairs skating. There is competitive strand….which goes to worlds, and then there is non-competitive route..which only goes to Nationals. The competitive strand, has 20 girls that skate at competitions, and allows for 4 alternate skaters, in-case one gets hurt or sick or something. The team, trains together, has a regular competitive season, just like the singles and pairs skaters. They practice and compete a short and a long program, with around 2:30 minutes for the short, and around 4:30 minutes for the long. The scoring system is exactly the same, but what they are marked on is different. In the competitive strand they are allowed to do some jumps, bust just a select few. They do footwork throughout the whole program, while attached in various ways to each other, different arm and hand holds, and they perform maneuvers like a circle, a line, wheels (pin wheel, four pin wheel, parallel wheel…. ), a block, an open block, lifts, moves in the field….and so forth. It is very interesting to watch, because even though these teams are doing the similar things, they all have a different take on them…..so no two are the same. Here is the Haydenetts short program from this year….they are currently the US Synchronized Figure Skating Champions. 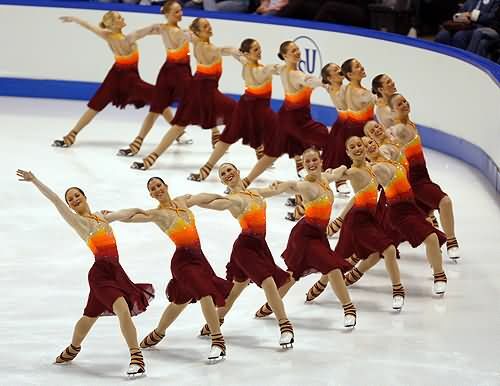 In the other strand of the synchronized skating, is the non-competitive. They only differ slightly by the number of skaters, 16 allowed to compete, the moves that they are allowed to perform, no lifts or jumps, and then they only compete one program instead of two, and the music lengths vary according to the level of the skaters. It always manages to astound me that the synchronized skaters of the world don’t get near the recognition that the singles/pairs skaters get, and yet when watching them, its amazing. The moves and the abilities that these skaters require are just as important as those of the singles and pairs skaters. By having to be able to skate with 16-20 other girls all at the same time, doing all of the same intricate footwork, pass-throughs, lifts, arm-holds, and many other requirements, they bring something fresh to the sport, and is far more interesting to watch, even after 10 teams have already gone. Because they have so much more diversity and are able to be more creative with what they have to incorporate within their programs, it give new meaning to the sport. This is a video from the 2006 Canadian National Championships. Nexxice , the team being shown, finished in 2nd place due to some falls in their long program, clearly should of been the winners, and by watching this program you can understand why. Even though synchronized skating doesn’t mean that the skaters, coaches, and fans don’t have to put up with the same bull that other figure skaters do, it just means that the world doesn’t hear about it as quickly. This part of the sport needs to be more recognized because it is truly beautiful and requires so much more than just flapping your arms and making a pretty face.